The submission of this reflective portfolio, completed as per the requirements of the capstone subject of the Masters in Education (Teacher Librarianship), is in many ways symbolic of the journey I’ve undertaken over the past three years, through a labyrinth of information and ideas. It represents the castle at the centre of the maze – for so long, the almost mythical focus of my studies, and now, I’m here, reflecting on the twists and turns behind me, and realising just how much of a journey still lays before me. But I’m getting ahead of myself. Every good journey metaphor needs an origin story, right? I had been working at Evans High School for almost 7 years. I taught English and HSIE, was a year advisor for the class of 2013 from their transition year right through until their graduation, and was heavily involved in a variety of initiatives throughout that time, including the Welfare and Student Support teams, the Technology team, and a wonderful role as the School Promotions officer. I still loved my school, so I didn’t necessarily want to look at positions elsewhere. But I needed something different to focus on now my babies had flown the coop. Cue the after-dinner phone call. When I heard who was speaking, I thought something was wrong – the Deputy Principal on the line wasn’t someone I had ever conversed with outside of school. But in reality, it was the lifeline I needed, the offer of a year of working in our school library to “see if we can make it a better place to be”. I ummed and ahhed, very briefly, before I jumped at the chance. Whilst I have always loved libraries, and they played a pivotal role in my own growth as a child, a teenager, a uni student, and an adult, I have to admit that I had not spent much time in the library at the school I’d been working for 7 years. I’d visit when I needed to use one of the computer labs, or when I was working with the STLA and needed a bigger space to do reading groups with a class, but apart from that I avoided it. In the lead-up to this fateful phone call, I’d been working in the library, sorting through the school archives to organize materials for the 40th anniversary of the school, and whilst I was tucked away downstairs in a corner, I’d had opportunity to observe the ways in which the library was being used, and it made me incredibly sad. There was little engagement with the fiction collection, and less with the non-fiction shelves. When classes came in, it was purely to use computer labs, or to work in a space with air conditioning – they could have been operating in a vacant building for all the impact the library had on their teaching and learning. And at recess and lunchtime, students gravitated to the library for the power point they needed to charge their phones, or because it was too hot outside. Fights were frequent, and staff on playground duty in the library frequently complained about the behaviour management issues they needed to deal with – it was Battleground Library, and it made my library-loving heart immeasurably sad, so see a library with no soul, no life, no character. The more I thought about the opportunity to work in the library for a year, the more excited I became, and my mind was teeming with ideas. Term 1 2014 saw me arrive in the library with nervous excitement, and whilst we made some great changes to the space early on which improved the culture of the library enormously, the biggest change was to my own perception of exactly what the role of a Teacher Librarian was. I spent much of the first term – indeed, the first year – feeling extremely overwhelmed, and out of my depth, and at some point throughout that term decided that I really needed to figure out what in the hell I was supposed to be doing in this wonderful, challenging, exciting role. So, I applied to complete my Masters in Teacher Librarianship, not even sure if my tenure in the library would continue past the current year, but knowing that this was what I was meant to be doing with my life. I’ve learned far more than I could have anticipated, and as I face the end of this learning it’s a challenging task to try and sum up the difference this course has made to my views on the role of the Teacher Librarian concisely! This portfolio consists of a number of posts related to some of the major learning elements I’ve undertaken over the past two and a half years. They are linked below, and if you click on the link for the first one, you’ll find options to bring you back here, or to take you to the next post. Enjoy the journey! What’s a TL do anyway? As I’ve worked my way through my Masters and come to grips with what it is I’m actually supposed to do in this weird and wonderful role, I’ve been hugely influenced by some significant figures in library land. Karen Bonanno’s reflections on the importance of advocating for the role of TL and its importance in relation to colleagues was a significant realization for me – I’m not just doing my job, I’m representing the importance of my profession in my school (Bonanno, 2011). The critical role of TL’s as the primary point of call for the 21st century learner, preparing students for the complexities of the 21st century information and learning landscape, is an idea that still resonates with me 2 years after I first discovered it (Khulthau, 2010, p17). Lamb’s powerful exhortation about my strength as a TL lying in my ability to partner with teachers sits strongly with me, as I recognize the profound impact that I can have on the curricular goals of the school, on student achievement, and on student engagement (Lamb, 2010). These ideas are all ones I strive to live up to, as I work my way into the role of TL and aim to honour that role at Evans High School. ASLA 2011. Karen Bonanno, Keynote speaker: A profession at the tipping point: Time to change the game plan from CSU-SIS Learning Centre on Vimeo. Sometimes I’m more conscious of how far I have to go in establishing the importance of the role of TL in our school and developing these essential connections between staff, than I am of how far we have come. There are still faculties with whom I’ve not done as much collaboration as I would like, and my goal in the coming year is to explore ways in which I can foster these connections and solidify my importance to them as an information resource and a teaching and learning partner. It was gratifying, then, when asking colleagues for some feedback as to how they see the role of Teacher Librarian in our school and the impact I have had in my time in the library to get some positive affirmations about how they saw my role and the successes I’ve had. ‘In her three years as teacher librarian, Tamara has reinvigorated the library, turning it into a vibrant learning hub at Evans HS. The reimagining of the fiction and non fiction collections have been tailored to student need, interest and the myriad of learning abilities and English language proficiency at EHS. Further, Tamara has worked with teaching and executive staff to deliver a vast array of new teaching and learning activities and experiences.’ DM, EHS Exec member. Over the past three years, I have worked with numerous staff to look at the role of our library in the larger organism that is our school. I’ve also come to grips with my own role within the library, and within the wider context of our school, and the complex relationships that form our staffing and management structure. I hadn’t really considered that my role involved elements of leadership, however, and that, for me, was a challenging aspect of my Masters study to wrap my head around – partly because I’ve never aspired to leadership positions, and partly because I found it difficult to reconcile what I perceived my own personality type to be with the kinds of traits I considered needed to be possessed by those who were “leaders”. I was inspired through my study of ETL504 Teacher Librarian as leader, to reconsider my role as leader – to recognize that leadership isn’t a title, but a role you adopt (Rodgers, 2014). As a result, I’ve taken ownership of my role as teacher librarian, embraced the ways in which I can lead the school. Fishburne’s (n.d.) discussion of leader as editor resonated strongly with me – the notion of the teacher librarian as one who synthesises the ideas and input from individuals into a cohesive story. The success of this endeavor lies in the strength of connections to develop effective teams (Aguilar, n.d.), which has been a key indicator of the types of interactions I have worked hard to establish. For example, after liaising with staff across all faculties, and establishing the need for greater academic rigor in regards to academic research and referencing, I developed a research and referencing handbook. This was presented to the executive for approval, introduced to staff as part of a professional development session, and implemented across the whole school through library lessons at the beginning of the year, and research lessons with classes as relevant faculty tasks arose. I worked with head teachers and faculties to establish individual subject area needs, and developed plans to meet these needs, with both research and resource development to support teaching and learning. I worked closely with the teacher of a yr7 HSIE class, who wasn’t confident in delivering research skills lessons to her students, and designed resources that supported her in this challenging task, as well as team teaching the lesson to assist her in developing her skills in this area. “Ms Rodgers had my Year 7 class in the library. She prepared work sheets and provided fantastic resources for the students to complete the research task. The students enjoyed the lesson and learnt quite a lot from it as we talked about it later and referred to the activity in other lessons as well. I learned a lot, too, and feel more confident about teaching research lessons in the future.” LM, EHS HSIE Teacher. I love my job, and I’m extraordinarily privileged to explore the many and varied opportunities my role affords me. I’m looking forward to continuing to develop my skills, as I work with the staff and students of Evans High School to create a library which we call be proud of. Computers and iPads and drones, oh my! I’ve always enjoyed technology. From my primary school days when I would volunteer to help my teachers with the duplicating (oh that smell! ), to my high school years when I would excitedly wait outside the maths staffroom at lunch time, pestering the head teacher to let me use his Commodore and type in pages and pages of code from a magazine in order to get a dodgy 8-bit game of Pacman or Space Invaders to operate, I’ve always been an early adopter. This has continued throughout my teaching career as I’ve been keen to experiment with and implement new technologies in my classroom. For example, during my time as an English teacher at Evans High School I developed a gaming program for a year 9 boys class, which focused on the narrative and character development through interactive games with multiple overlapping storylines. This required students to demonstrate an understanding of the structure of gaming, and to work with complex multimodal texts to analyse the effectiveness of a variety of gaming texts. See also our epic Angry Birds lesson as part of a creative writing task, which demonstrates my willingness to try new things with technology – and, in turn, reflects the important role that gaming can play in education. Jane McGonigal’s TED talk, “Gaming can make a better world”, reflects my belief in the importance of gaming and fun in learning (2010). So, it was with this passion for technology as a means of engagement and collaboration that I approached our library technology plan. A previous principal had decided to convert significant amounts of the library floor space to establish 3 computer labs, which had been used for teaching and learning purposes during class time, with limited availability for students during breaks to complete study and homework. My studies, as well as my independent research about best practice in the modern school library, have provided me with enormous insight into the many and varied opportunities for technology integration and inclusion. ASLA and ALIA’s joint statement on school libraries and ICT provided some valuable guidance relating to the inclusion of technologies in the future school library (ASLA, 2016), whilst Holland advocates for a new paradigm of technology in the 21st century library, using emerging technologies to enhance the more traditional aspects of the school library, rather than supplant them (Holland, 2015). With this in mind, I worked closely with our technology team to examine the possibilities for expanding technology offerings in our library. Research into available technologies that would allow students to move away from a traditional “around the wall” configuration when working on computers gave us many options, and we purchased a combination of touch screen laptops, chromebooks, and iPads, which are managed through the library catalogue for individual loan by students, bookable through our SENTRAL system for class bookings by staff, and stored in a charge and sync trolley for ease of management. Just providing the technology didn’t introduce massive changes, however. Initially, staff using the devices continued to do so in much the same way as they had in the computer lab – the devices and geography had changed, but the practice hadn’t. Around the same time as we had expanded our available technology to include these devices, I was studying Social Networking for Information Professionals (INF506), one of my Masters electives, and I came across The “Building Academic Library 2.0” video, part of a symposium sponsored by Librarians Association of the University of California, Berkeley Division in 2007. This was a thought-provoking session, and if you haven’t seen it I’d recommend making a cuppa and settling in for an hour. It helped provide me with some much needed context as I looked at moving our library more from the more static, traditional mindset, to a more a more dynamic engaging landscape for learning. I was inspired to consult with our school community in regards to what they wanted in regards to technology, and how they’d like to use it. (Rodgers, 2015) This led to us surveying both staff and students, and establishing an action plan for the use of these devices in our library. I worked with the technology team to implement “Tech Byte Tuesdays”, where staff can attend a quick half hour session on for some tech training that will support their use of technology in the classroom. I also worked closely with faculties to offer team teaching and training on the use of iPads with classes, for both independent and group tasks. Feedback from staff has been wonderful as a result of these changes. I have been conscious of ensuring that my efforts have been accessible to all staff, and have been inclusive of the Intensive English Centre teachers and classes. The testimonials below from staff indicate the effectiveness of this change in technology use, and the role of the teacher librarian in effecting these changes, and I’m looking forward to continuing to ensure that staff feel supported in implementing new ways to incorporate technology into their classroom, to help meet their teaching and learning goals. “Over the past year, I have used iPads and Chromebooks on a semi-regular basis in the library. The space has dramatically changed for the better and makes for a more positive learning environment. The students have really enjoyed setting up camp on bean-bags, couches and the steps to settle in for a technology lesson. Students have particularly embraced the use of the Chromebooks, engaging with Google Drive and Google Classroom. The library and the librarian have facilitated this learning. Our librarian is on-hand to guide students through newly implemented technologies and platforms around the school.” MK, IEC teacher. 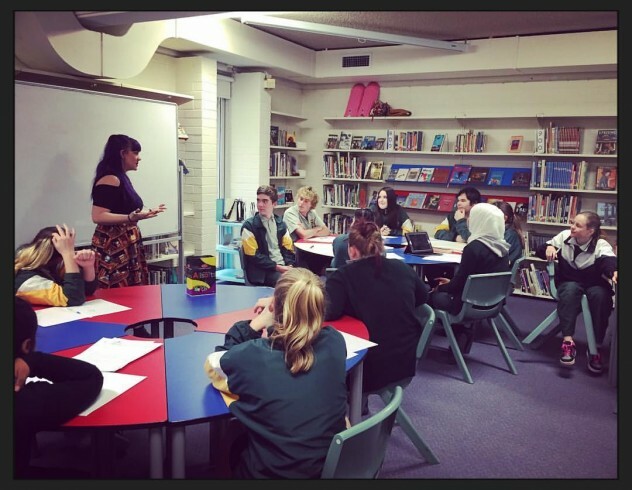 “My year 9 kids enjoyed a library sponsored seminar on book trailers given by visiting authors. When they were working on their own book trailer they chose to set the ‘book’ in the library…good access to technology and support in an interesting space made this their natural choice for zombie apocalypse fantasies…and they knew the librarian would be totally accommodating -even if it meant playing a part.” JM, EHS English teacher. I’m gratified that my passion for technology, my consultation with our technology team, and my collaboration with teaching staff is having an impact on teaching and learning, and supporting a stronger culture of engagement in our wonderful library space. A common trend in libraries has been the implementation of the Makerspace, as indicated in recent Horizon reports (see, for example, the 2017 NMC Horizon project wiki: NMC, 2017), and by the increasing prevalence of makerspace zones in both school and public libraries (Slatter and Howard, 2013). The past 12 months have seen the development of the Makerspace@Evans, which has been guided by student interests via survey (http://bit.ly/EvansMakerspace), and in consultation with TAS staff, to support their curriculum needs for multimedia and ICT subjects. Encouraged by my collaboration with other teacher librarians I was studying with, I reached out to my professional network, and examined what was working at other schools, drawing much inspiration from the work being done at Sydney Secondary College in the development of their fantastic makerspace. I worked with the HT TAS to apply for a grant for funding, and have worked with a student team to renovate a previously unused room in the library to house our Makerspace. Student engagement in the process of developing the makerspace was vital, from planning activities to designing the space itself, and everything in between (Legeros, 2016). Our makerspace is a diverse collection of opportunities to explore, create, and innovate. We have 4 wall-mounted TV’s with gaming consoles, lego, craft stations, raspberry pis, and a collection of robots, including ozobots, spheros, and lego robotics. It’s an evolving space, still in the early stages of implementation. We have trialled some coding lessons with selected year 9 and 10 TAS classes, and have run superhero paper circuits workshops as part of our primary school taster lessons programs, which were run by student tech warriors, who took ownership of the activity, and displayed confidence in delivering the workshop to both students and teachers. The most successful of our Makerspace ventures thus far has been a series of sessions with our Autism Unit. In consultation with staff, I planned and delivered a series of lessons, providing students with the opportunity to engage with a range of technologies from our makerspace. These included an electronics workshop creating paper circuits, interactive gaming sessions providing opportunities for both collaborative and independent play, and coding and robotics sessions using programming apps and our Sphero SPRK robots and accessories. The benefit of these makerspace sessions was the flexibility and adaptability of the activities, a feature which is essential for a group of students with such diversity of skills, abilities and interests (Waters, 2014). It allowed students to engage with the activity at their own level, whilst providing opportunities for extension and challenge as appropriate. Feedback from Autism Unit staff was overwhelmingly positive, as indicated by this podcast, recorded in an interview with Steve, one of the Autism unit teachers, and a close collaborator of mine in developing our makerspace programs. As a result of the success of these initial sessions with students, we have planned more makerspace workshops in 2017, including an extended STEM program as part of a Multimedia unit, as well as more shorter independent sessions. 2017 will also see more collaboration with other teachers, particularly those in STEM subjects, to develop teaching and learning opportunities for students using our makerspace, and I will be working with students to develop opportunities for them to use the resources outside of their timetabled classes (eg lunchtime, before and after school). I’m looking forward to continuing to explore ways that I can work with staff and students to leverage the impact of technology in our library in order to improve student outcomes and engagement, and to support staff in their teaching and learning goals. 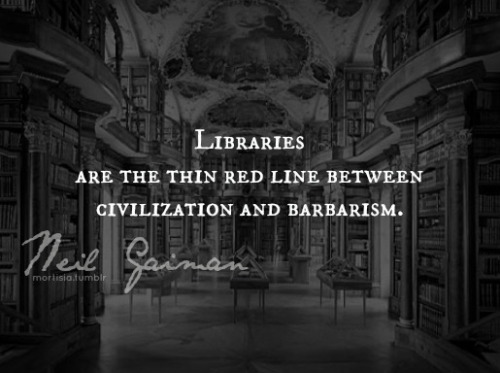 Libraries have always been a place of refuge for me, a place where I found information, inspiration, and connection. One of my greatest desires in my time in the Library@Evans is to help create that kind of connection for my students and colleagues. I want our library to be a place that they instinctively go to when they need to know, think, feel, discover, wonder. This is a multifaceted goal, which requires both an improvement in the literacy skills of our students and an increased engagement with the resources we have available in our collection. Evans has been implementing the Reading To Learn (R2L) program, across both the high school and IEC for the past three years. R2L has a strong focus on developing reading and literacy skills through the use of a structured program, focusing on age and stage appropriate texts, regardless of reading ability. I liaised regularly with faculties to ascertain the kinds of resources they needed to support their R2L lessons, and researched texts to ensure their suitability for both syllabus content and reading level. This coincided with the writing of our collection development policy, which our library had previously not had, and provided us with the opportunity to examine the non-fiction collection, and undertake an extensive and much-needed weeding project. I had, mostly unconsciously, always considered that fiction and non-fiction were the two extremes in our collection – fiction was useful for English and for enjoyment, and non-fiction where you went if you were after knowledge, or resources to support the rest of the subjects on your timetable. One wasn’t better than the other, but they were inherently separate worlds. ETL402 Literature Across the Curriculum challenged those assumptions for me, however (Rodgers, 2015). Pennington’s (2010) discussion about the use of science fiction as an engaging resource for science lessons impacted my perception of useful resources for various curriculum areas. My learning in this subject translated into increased opportunities for my students, as in my consultation with faculties about their subject needs, I deliberately sought out opportunities to provide literature resources for non-traditional literature topics (for example, the graphic novel Ancient History lesson referenced in my first post). This also let to an investigation of other ways in which I could provide authentic learning opportunities for students, and led to the development of the “Experts of Evans” project. Our aim is to provide student access to people as resources – to engage with experts in their fields of study, rather than simply relying on information located in electronic and print resources. This has taught me to challenge my own assumptions about what we traditionally view as appropriate resources for subjects, and to explore ways to expand the connections between texts. My aim, then, is to provide students with a richer learning experience, as they develop greater skills in navigating an increasingly complex world of texts that surround them. In order for students to improve their reading skills, and thus their engagement with all the wonderful gifts that a rich literary life can offer, we needed to look closely at our fiction collection. Extensive weeding and purchasing was carried out, and I greatly appreciated the lessons learnt during ETL503 Resourcing the Curriculum. Hughes-Hassall’s (2010) guidelines on collection development provided some much-needed guidance as we worked to create a collection that would meet the needs and interests of our students, and helped with the development of our collection management plan. Similarly, Olin’s discussion of the importance of weeding helped guide the decisions we made in regards to resources that had been on the shelves for years without being touched. Regular consultation with students, along with liaising with booksellers and reader advisory sites, helped us to create a more appealing fiction collection. 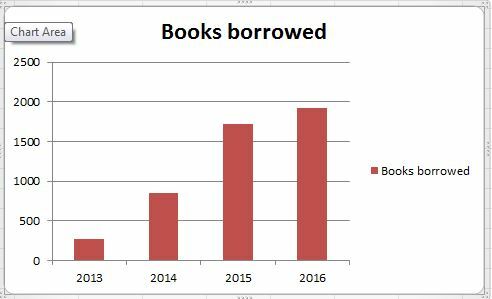 This, combined with frequent promotion of the collection (for example, through our @evanslibrary Instagram account), led to a significant increase in borrowing. This table shows overall borrowing, which has had a consistent upward trend. In 2017, our aim is to further analyse engagement with the collection across the various section we have, to gain a greater understanding of borrowing patterns and needs. 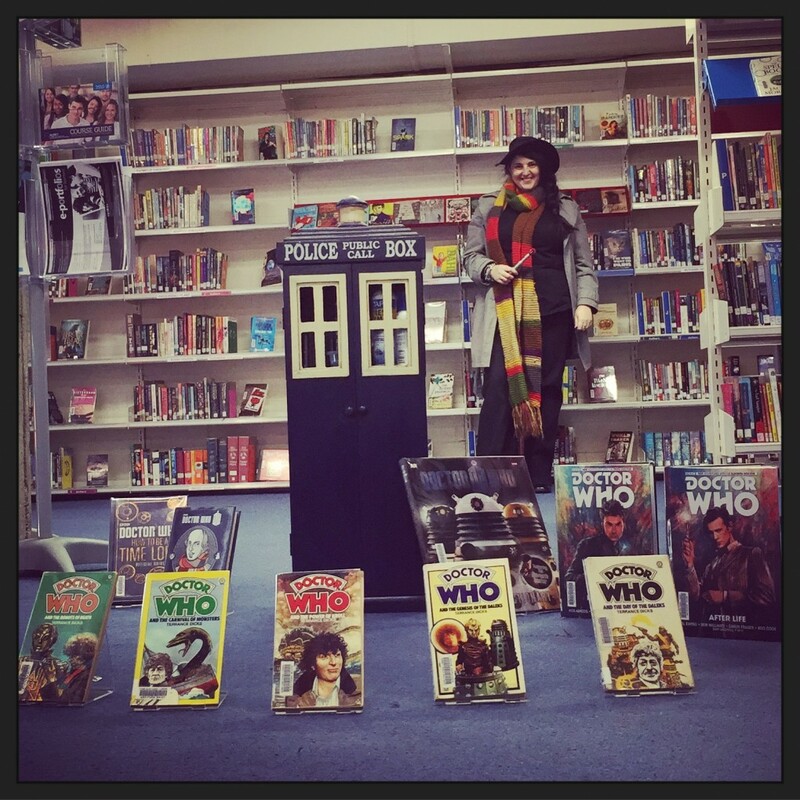 The increased enthusiasm shown by our school community for engaging with the wonderful worlds that surrounded them on the shelves has been evident, too, in the increased interest and involvement in library activities, such as writing workshops, author talks, and reading bootcamps. Over the 2016-2017 summer holidays, we ran an Evans Summer Reading Challenge, which required students to sign up, filling out a personal reading preference survey, and then take home a specially selected collection of books to read. You can read more about the whole challenge HERE. The success of this challenge is a key indicator of the increased engagement of both students and staff with the library, and the improving reading culture of our school. When asked for feedback on our library, one staff member provided the following list of her thoughts, which I think encapsulates for me the successes we have accomplished in recent years. “1- The setting in the library is more inviting. 2- Online system makes it easier to find books. 3- I got a lot of pleasure from reading more contemporary books and got introduced to new authors. 4- Workshops with authors really encouraged students to learn about the writing process and the importance of language. 5- You [the teacher librarian] always have time to help students and staff with book choices. 6- There is a larger section for graphic novels for students who prefer lighter reading. Somehow, despite the time that putting this portfolio has taken, and the breadth of learning experiences it covers, this feels like a somewhat superficial exploration of the impact that the Masters in Education (Teacher Librarianship) has had on my life, and how I view myself as a teacher librarian. There are so many other elements that could easily have taken up an entire post on their own – decisions about reclassifying collection material, for example, establishing a quick reads collection organised by genre rather than DDC in order to support our beginning readers from the IEC. The Library Warriors crew, and its impact on engagement within the library. The development of our social media strategy, which has been used as a model for social media interactions for libraries both in NSW and interstate, through my presentations at numerous conferences. 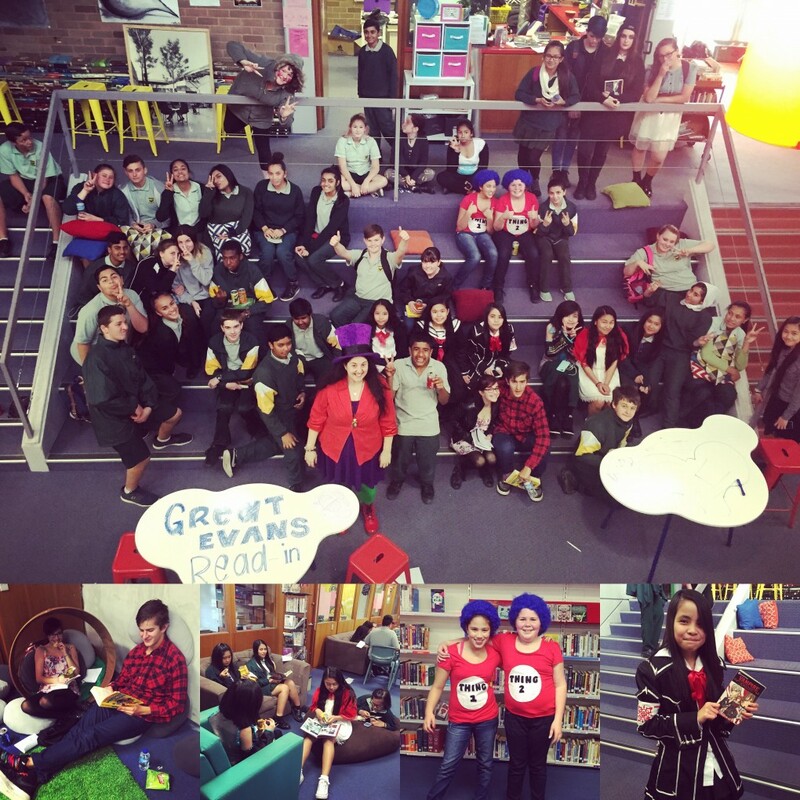 Our increasingly awesome book week celebrations, from their origins with a single hour long read-in three years ago to the week long Festival of Stories in 2016. I made mention previously of a few of the changes that have been noted by staff members, and which I’m counting as my “measures of success”, as we strive to ensure that the Library@Evans meets the needs of our whole school community: here are a couple more, which really resonate with me, as indicators that what I do makes a difference. These awesome successes, the ones that impact the students’ connection with the library and confidence in their own learning, are the ones of which I am most proud, and will strive to continue to develop. “I have been at Evans for 20 years plus and have been greatly heartened by changes made to the library over the past couple of years. It used to be the air conditioning that got kids into the library on hot or cold days, and patrons were thin on the ground a lot of the time when the weather was kinder. Now kids go to hang out and to meet books and enjoy the space and read books and talk about books. They use technology to work on their own stuff or assignments and make use of access to help and support. The library is now owned by the students and if any new student wanders in, the actions of the library warriors and the happy buzz etc communicate quickly that this is a student friendly place. Evans kids are proud of their library because they like to be associated with excellence and innovation and ‘cool’. Apart from the great lessons taught to students by visiting authors etc, the fact that they are being paid deep respect by people with expertise who believe in their intelligence and creativity is in itself a terrific encouragement to students. Kids get inspired but they also get confidence to take risks -which is huge when it comes to their own writing. The enthusiasm for writing and for wide reading among my English students has grown, and I expect this to have an impact on their achievement of outcomes. Attitudinal change is no small part of this. The transformation of the library has had a significant impact on how lots of learners think about themselves and their school.” JM, EHS English teacher. As I reflect on the many, varied roles I undertake on a daily basis, I’m reminded of Valenza’s comment about teacher librarians and what we do, in that “there is no textbook for what effective practice looks like in continually morphing information and communication landscapes” (2010). In many ways, we make it up as we go along – with reference to our community of TL’s, certainly, and to the research and literature that surrounds us. But largely, my experience as TL is going to be different from any other, because it is determined by the unique connections that surround me, and the needs and interests of my school community. And that’s both exciting and terrifying. I’m incredibly grateful to the wonderful community that have supported me on this learning journey, and who enable me to be the best teacher librarian I can be. The colleagues who have encouraged me, and provided me with much needed feedback about our progress in the library. The CSU academics who have given me advice and support as I struggled with some of the complexities of this course. The fellow students as part of our super-secret “TL’s in Training” group, who have commiserated, collaborated, and basically been legends throughout this whole process. And finally, the people in my life who have my back. Family, friends, loved ones – you know who you are. Your support, your encouragement, and your presence in my life is what made this crazy “yes I can do post-grad study while working full time, being a single parent, and thinking I can do it all” gig possible. And you rock. Thank you, thank you, thank you. Lamb, A. (2011). Bursting with potential: Mixing a media specialist’s palette. Techtrends: Linking Research & Practice To Improve Learning, 55(4), 27-36. Rodgers, T, and Sarris, B. (2016) Oasis in the library. LearningHub: The journal of the School Library Association of NSW. Volume 2, Autumn 2016, p22. Category: Uni Life: MEd (TL) | 1 Comment on Final thoughts? Running a library can be an overwhelming business. The depth and complexity of the task at hand is one that is not to be undertaken lightly, and a cornerstone of this library management task is the provision of a system by which library users can locate and access the resources that we work so hard to curate in our collections – the ubiquitous library catalogue. I must admit, when I first took over the role at Evans High School almost three years ago, I took the catalogue for granted. It was there, running away quietly on its delightfully outdated DOS based system. I complained about its quirks, the blue screens of death that plagued it, and its unwillingness to allow me to use my lego mouse in order to navigate my way around it, but I didn’t really consider what was there, beyond just a database of the stuff we had. In 2015, we transitioned to Oliver as our library management system, and my interest in the library catalogue shifted gears, as I started to gain a more complete understanding of what it could do for our staff and students. I still took the back end pretty much for granted though. We are a NSW DoE school. SCIS do our catalogue entries for us. I love them for that, and have had, on occasion, the need to contact them to query a specific entry, or to clarify why certain classifications have been assigned the way they have. The SCIS Wizards have always been amazingly helpful, and incredibly knowledgeable. And I just accepted the black magic they weave on our system, providing us with the spells to import the information we need, which just appeared like voodoo magic on the screen. But then, I put on my big girl pants, reminded myself that I’m a responsible adult, and just got on with it. I worked my way through Ferber. No, wait – FRBR. The Functional Requirements of Bibliographic Records (IFLA, 1998) outline what you need in your catalogue entries in order for those entries to be useful. And, I have to say, it’s something I’d not considered. I just assumed that all that voodoo SCIS did made it work for me. Hider (2012) held my hand as I fell down the rabbit hole of resource description, and Manifold unpacked for me my ETL505 mantra – Metadata. Metadata. I repeat it because it’s a cool word to say, like a meditative “Om”. So, the answer to my “why” questions? I mean, the one about “why I need to do this” – I’ve made peace with the fact that CSU doesn’t really hold a grudge against me. One of the goals of libraries is to provide users with access to information. That’s pretty straightforward, right? Students come in looking for a book to read, or some information about an assignment they are completing, and we help them find what they need. Ensuring that users are able to access the information they require is essential (Hider, 2012), and the systems we have in place to facilitate this information organisation are critical to maximising the benefits for users of our library service. It matters not how great our collection is, if people can’t find what they need! I found the RDA Toolkit (American Library Association, 2010) to be a challenging experience. I found developing an understanding of the standards for SCIS subject headings (ESA, 2015) to be a challenging experience. I found WebDewey (2015) to be a challenging experience. (Sensing a theme here?) But what I also found in these experiences was a deeper understanding of the voodoo of cataloguing. I used the analogy recently to that of figuring out how a car works. Before I separated from my husband, he took care of all that stuff under the hood – I put in petrol, and turned the key. When I could no longer rely on his assistance, however, I had to figure it out for myself. I sorted out where the oil and coolant went, and why they were important. I had discussions with my mechanic about what that mysterious ticking noise was, and was even able to make some educated guesses about what might be wrong. And I gained a much better understanding on how things worked and why. So, where to from here? The future of information organisation in library services is only going to increase in complexity. When faced with searching for information, I must admit I rely on Google as my first port of call, rather than searching our library catalogue, and the preference of our students to just “google it” is a challenge we need to face as we move forward into an increasingly connected digital world. Ensuring that our systems for providing access to information are up to the task is a challenge, and requires a comprehensive understanding of the concepts and systems which underpin information description and organisation. I don’t think I’m there yet – I’m still very much an amateur enthusiast in the field of library voodoo mechanics – but I’m working on it! I’ve been extremely fortunate over the past 2.5 years to have the opportunity to be working in a NSWDEC high school library, which was in dire need of some love and attention, particularly in relation to the much neglected collection. I almost wish I had completed this subject earlier in my Masters program, so that I could have benefited from the wisdom I’ve discovered from ETL503 during the process of making difficult decisions about the library collection! I apprecieated the opportunity to develop my skills around crafting a collection to meet specific curriculum requirements in the first assignment (Rodgers, 2016). This final assignment provided the opportunity to engage in the meaningful and relevant process of proposing a Collection Development Policy. This has had significant impacts on my professional practice, both in regards to the policies we are developing to support the future direction of the library, and on the shape and scope of our library collection. As my understanding of Resource Management has developed throughout this subject, I have been struck by how drastic a state our library collection was in before I started working there. I have also been impressed by how well many of the decisions my library assistant and I have made over the past years, have fit within the suggestions for best practice for a library collection. One of our main goals when we first began culling and renewing the collection was to decrease the amount of material on each shelf, as they were almost 100% filled. After our extensive process of resource evaluation and rejuvenation, our shelving is now at approximately 75-80% capacity, containing resources which are in excellent condition, and are relevant and engaging. It is from this perspective that I approached this subject – as someone who had recently gone through a major collection overhaul, and was now looking for ways to ensure that the person who follows me will inherit a collection in much better shape, and with much more relevance to the school community than the one that fell in my lap. Establishing a clear set of selection criteria, then, has been of enormous benefit to both our library, and my professional practice. Ditto to the impact of our new Collection Development Policy. I have to agree with the Australian Library and Information Association Schools’ assertion that such a policy is essential, as it explains the reason such a collection exists within schools (ALIA, 2007). Given the fractured history of the library at my school, it is gratifying to now have documentation with clearly highlights the benefits of a well-resourced library for our school community. I have also come to realize how important the multiple levels of analysis in regards to collection management are, as outlined by Hughes-Hassell (2005). Having an in-depth knowledge of my resources, a clear understanding of my students, strong collaborative partnerships with other teaching staff, and a sound understanding of the teaching and learning programs of the school, allows me to have a strong sense of purpose as I continue to build a library that meets the multiple varied needs of our school community. I love books. I doubt this is an uncommon feature for any Teacher Librarian. But, as someone with a passion for books and the stories they provide, I have always found disposing of books from my own collection an extremely difficult task. This, then, has been one of my main challenges with the collection development process, and one of the key takeaway messages for me – understanding that in the collection development process, what you remove is as significant as what you add (Olin, 2012). Finally, in recent weeks the importance of having a responsive and flexible collection has been driven home to me. Having spent significant time and energy establishing a Senior Study collection, in consultation with staff and students, and ensuring that all current Stage 6 courses are sufficiently resourced for our seniors, the recent announcement of new HSC syllabuses reminded me that our work is never done! Tomorrow, next month, next year … whilst many changes in education and school libraries may be predictable, and able to be planned for through analysis of such work as the Horizon Report, there are a great many potentialities that are out of our control. It is because of this uncertainty that it’s so important for the Teacher Librarian to be responsive to the ever-changing climate of their school community, and plan accordingly to ensure that the Library remains the beating heart of the school. THis resource is available through subscription to Britannica Online, and was selected after conducting a search on the database. Providing age and stage appropriate texts for students is one of the key requirements of the school’s Reading2Learn program. One of the core benefits of this resource is the opportunity to adjust the reading level of the text, depending on the skills and abilities of the class, whilst still ensuring that the information is stage appropriate. This is particularly useful for those classes that have a higher proportion of LBOTE students, as the lower reading level texts can be used to support students’ initial understanding of and engagement with the material, and then the higher reading level texts can be used to model more complex writing and text types. Curriculum Support (n.d.). “Campfire -Stories”. http://www.curriculumsupport.education.nsw.gov.au/secondary/languages/languages/aboriginal/campfire/stories/index.htm Accessed 10 April 2016. Campfire Stories in an interactive website, which presents a series of interviews from Aboriginal elders and community members, organised by local area. This resource was located via search on Curriculum Support. The website is simple to operate, and provides a number of first person accounts of indigenous experiences.One of the key benefits of this resource is its accessibility – both in terms of its availability to students, and the ease of understanding of the material. Given that it is a freely available site, there is no cost for use, which makes it an attractive option. As a teaching resource, it has enormous benefits, as it is linked to specific syllabus outcomes, and provides a range of teaching notes and suggestions for activities, and relevant links to quality teaching elements. The resource has academic and cultural integrity, and is an appropriate medium to present first-person interviews, so that students are able to hear indigenous experiences from those who have experienced them. This provides students with greater opportunities to develop their understanding of individual experiences, which is an essential element of the Depth Study. This resource was initially located via a search on SCIS for the keyword “Darug”, after a request by the teacher for resources which provided specific information relating to the Aboriginal land on which Evans High School is situated. The text located on SCIS was a 2006 edition (SCIS number 1324880), but further research located a revised edition of the text, which has updated primary sources and maps. The key benefits of this resource against Hughes-Hassell and Mancall’s selection criteria (2005) are its authority, and the comparison with other works. The author is well respected in the local indigenous community, and the resource demonstrated a strong understanding of local indigenous history. Whilst there are numerous texts available which present useful information about Indigenous Australian history, there is little available which examines the history of the land and people with a focus on distinct Aboriginal regions. Whilst the presentation of the information may be relatively unengaging for students, it provides a depth and breadth of local indigenous history that would be of outstanding benefit as a teaching resource. Laguna Bay (2011). Family anthology. Oxford University Press, Melbourne Australia. Family anthology is part of the Yarning Strong series, which presents aboriginal stories and culture in engaging and informative ways. Texts in this series are used regularly at Evans High School library, and as such is included in this resources list through personal recommendation. The physical and aesthetic quality of the text warrants its inclusion in the collection, as it presents both the fiction and non-fiction text elements in a vibrant, engaging fashion, which are appealing to a teenage audience. The other key criteria that sets this text apart is its appropriateness for learners. The content is accurate and informative, and presented in a variety of text types, in language that would be accessible for students from diverse language backgrounds. Other texts in this series would also help support the Indigenous cultures program, particularly in regards to the development of a sense of empathy for indigenous experiences, both as a society and as individuals. NSW Board of Studies (2016). “Teaching heritage: Indigenous timeline.” http://www.teachingheritage.nsw.edu.au/section03/timeindig.php Accessed 10 April 2016. The Indigenous Timeline resource from the Board of Studies site was sourced via recommendation from a colleague, as a site which they have found useful in presenting an outline of major points of contact between Indigenous society and British colonisers. The accessibility of this text, as a freely available website published by a reputable source, is a key criteria for its inclusion in the collection. The accuracy of the information presented is another feature which recommends it. An element of the Indigenous timeline for teachers to be aware of is the cultural bias of the information presented. Whilst it presents a chronological background of Indigenous history, this is largely focused around Indigenous interactions with colonising and white cultures. This is a feature worth discussing with students, and allows for an examination of the nature of cultural bias in historical representations. Pascoe, B (2012). The little red yellow black book : an introduction to indigenous Australia. Australian Institute of Aboriginal and Torres Strait Islander Studies, Canberra. The little yellow red black book: an introduction to indigenous Australia was included in this collection after reading a number of reviews, including those featured on IndigenousX (n.d.) and Goodreads (n.d.) It’s clear writing style makes it accessible to a wide range of readers, and ensures that it will be a valuable resource for both native English speakers, and the wide range of LBOTE students that are students of Evans High School. Its brevity (at only 140 total) also makes it an accessible text, as it is presents a breadth of information, without significant depth. There are a range of additional resources and research pathways provided within the text for readers to further explore issues as needed, which makes text an excellent entrypoint into many Indigenous issues. The key features of this resource that warrant its inclusion in this list relate to the comprehensive and culturally sensitive way that it presents an inclusive view of Aboriginal history, over 60,000 years. It effectively weaves a historical overview with personal experience, and provides a clear overview of a range of cultural protocols and ethical issues for non-Indigenous people. This resource was discovered as a recommendation from a colleague on a HSIE facebook teachers’ discussion group, and has been added to the Stage 4 program as an essential teaching resource for the unit of work. Whilst all episodes are useful for the teaching of Indigenous History, the first three episodes are particularly relevant for the syllabus elements relating to early British contact with Aboriginals. The documentary is well presented, and provides an engaging and authentic indigenous voice to segments of Australian history which have been traditionally told from a white-centric point of view. As such, this resource is particularly strong in the selection criteria of accuracy, treatment and authority. The documentary episodes are extremely successful in presenting Indigenous history in a culturally relevant way. They employ oral storytelling traditions, which are an important part of indigenous history, should be incorporated in an understanding of Indigenous culture (NSW Board of Studies, n.d.) There are a wide range of authentic primary and secondary historical sources used throughout the documentary, which reinforces the value of this resource as part of a strong teaching and learning program for the HSIE Indigenous Society Depth Study. Smith, K (2010) Nari nawi : Aboriginal odysseys. Rosenberg Publishing, Dural NSW. Nari nawi was sourced via a search on Trove, focussing on early contact Indigenous experiences. This resource was produced to accompany the Nari Nawi : Aboriginal odysseys exhibition held at the State Library of NSW, and there are a number of resources available to support the printed text. These include a gallery of the rare images featured in the State Library collection (ABC, 2010) and the Indigenous voices collection at the State Library (outlined in Thorpe and Byrne, 2014). This resource is particularly useful in assisting students with an understanding of one of the core components of the depth study, which requires students to “describe and assess the life of ONE Aboriginal and Torres Strait Islander individual in contact with the British colonisers” (NSW BOSTES, 2016a). Nari nawi presents a variety of primary and secondary sources relating to the experiences of an individual Aboriginal person in the years soon after colonisation, and provides a distinctly Indigenous representation of a period of history that is typically portrayed from the perspective of the colonisers. As such, the treatment of the historical period, and the appropriateness of the material for an Indigenous Cultures unit, make this a worthwhile addition to the collection. Wheatley, N. (2008) My place. Walker Books, Newtown. The picture book, My place, by Nadia Wheatley, creates an engaging fictional narrative about the history of a single house/tree, which features as part of the oral history of the children living in this place in ten year gaps, leading back to the year of colonisation. When used by itself as a resource, the map and key features of the text allow for an engaging illustration of the changing nature of a community’s relationship with the land on which they live. The text accurately represents immigration patterns and historical events through the lives of the child narrators, and this provides opportunities to examine the ways in which fictional and factual texts differ. The award winning TV series based on My place, produced by the ABC, and in particular Episode 23, would also be a useful resource to support teaching and learning in this unit. This episode represents the experiences of an Aboriginal girl during the year of colonisation, in which she encounters unfamiliar animals and situations. The skillful filming and characterisation of these encounters allows for the development of a strong sense of empathy, and creates an engaging portrayal of a potential scenario involving an Indigenous individual with colonisers, supporting one of the key requirements of the syllabus for this Depth study. The website which supports the TV series provides students with additional opportunities to engage and interact with the content and concepts of the show. These three resources were included as a result of a scootle search, combined with personal recommendation. Whilst they are fictional in nature, I believe that they are worthy inclusions in a resource list supporting an Indigenous cultures unit because of their potential benefits for students in developing a sense of empathy for the experiences of Indigenous people of a similar age to them, and for the opportunity to develop a stronger understanding of the role of storytelling and the oral tradition in a modern context. ABC Radio National (2010) Nari nawi : Aboriginal odysseys. Radio National: Awaye! Evans High School (2016b) Library management plan. Evans High School Library, Blacktown. Hughes-Hassell,S. & Mancall, J.C. (2005). Selecting Resources for Learning. In Collection management for youth: Responding to the needs of learnersi (pp.33-51) Chicago: American Library Association. I’m now half way through my studies in the Masters of Education (Teacher Librarianship) course, and it’s been an interesting journey (cue bad reality tv metaphors here!) The subject that this blog post is submitted in requirements for, Social Media for Information Professionals, has been in many ways the most challenging for me. I approached the subject with what now appears to be a sense of over-confidence. I’m considered somewhat of a social media expert in my region, and have been frequently called upon to present at conferences or professional development sessions, as well as liaising with the NSWDEC on the development of departmental social media policies and plans. I’m confident in my ability to use social media in both my personal and professional life. So, to have struggled to hit the mark, I believe, given the results I received from the social media project assessment task, was particularly disappointing. I’m glad about this though. It’s given me much food for thought as I consider my role as a social media advocate, and the way in which I integrate my academic life and my professional life. This is a cogent point for consideration, given the focus of this subject on the use of social media in information services, and the potential (indeed, often the goal) of blurring the lines between work life and social life. If I, as someone who is quite comfortable in the use of social media, and prides myself on presenting excellence in academic and professional work, can get “sucked in” by the relative familiarity of social media tools, and end up presenting an assessment task which fails to meet the required academic conventions and standards expected, what are the implications of this? Particularly for my target group of users, high school students – teens who are perhaps more fluent in many ways in social media and web2.0 than I am, but perhaps not as committed to the idea of importance of academic conventions. So, it’s given me much food for thought on how I lead the blending of social media and the necessary focus on academic writing, particularly for my senior students as they prepare for HSC and further study. It has also led me to consider much about what I thought I knew about social media, and to realise that I’m very reliant on what I know, and am familiar with. My experiences with Second Life, for example, highlighted how quickly I retreat to what is familiar – even when I don’t find a task difficult, I don’t necessarily adopt it as part of my common practice if it isn’t in my immediate frame of reference. This prompted more reflection on the roles of social media in my library practice, and consolidated the importance of ensuring that when we decide on implementing a social media strategy for our patrons, it’s based on their needs and interests, not on what is familiar to us. Cohen’s Librarian 2.0 Manifesto was incredibly resonant for me in this regard – the notion of us as professionals being willing, and indeed embracing, the idea that we need to go to where our users are, rather than expecting them to come to us (Cohen, 2007). If the students in my school are familiar with, and active users of, Instagram, it makes sense to explore ways in which our library can connect with them, and this has been one of the key successes of my ongoing Library Warriors project, as has the establishment of a Facebook group, which I continuing to develop into a successful platform for collaboration and discussion amongst this passionate group of students. My initial thoughts about developing a Goodreads presence, however, was more about my own skills and experiences, rather than what met the needs of my school community. For me, then, one of the key takeaway messages of this subject has been the focus on what my users need and want – not just what I’m comfortable in delivering. Thankfully sometimes those two things will line up – but I’m more comfortable now with embracing the idea that I don’t have to be the expert. I can find someone who is, and learn from them, which has the dual effect of developing my own skills, and also modelling for my students the benefits of lifelong learning. So, reflecting on my learning for this session has consolidated for me a few things. Firstly, I am evermore in love with my career of choice. The focus on lifelong learning is a core passion of mine, and the fact that I have been able to gain new insights into both my own learning processes, and draw upon this to examine the way I operate professionally, has been immensely rewarding. I have printed out Cohen’s Manifesto, and have it in sight each day at work (with some helpful suggestions added by students – “buy more chocolate!!”). I am encouraged by my failures, and have discussed them with my students as an example of what I am learning, in the hope that they will learn something from it, as I have. And I will continue to advocate social media in education, and in our libraries – and I will make sure that in the future I will give as much credence to the opinions of my school community as I do my own preferences. Isn’t it interesting when the subjects you will initially think will be the easiest to conquer, will be the ones that become the most challenging and thought-provoking? The future for Information Professionals is exciting. Rather than existing purely in a paper-based world, today’s library operates in an increasingly multimodal landscape, with an ever-increasing web of tools, resources and contributions at their disposal (Harvey, 2009). It is essential that a 21st century librarian is able to adapt to the changes around them, and to strive to provide the best service they can to their clients (Bonanno, 2011). Drawing on the extraordinary variety of Web2.0 tools, then, is an essential element of the librarian’s service. Web 2.0, as discussed in Rodgers’ blogpost “Oh what a tangled web we weave – Web2.0” (2015a) provides extraordinary opportunities for libraries to leverage the quality and quantity of web resources and information to clients. Web 2.0 provides opportunities for users to engage with the wider web world – the Wikipedia definition (n.d.) of Web 2.0 as encompassing “user-generated content, usability, and interoperability” reflects key goals of the 21st library, as engaging with their users, and as such, resonates as an important reason for information professionals to include Web 2.0 tools as one of their core tools. Employing Web 2.0 tools as part of the library service supports allowing users “to contribute content in order to enhance their learning experience and provide assistance to their peers” (Cohen, 2007), and it takes advantage of the idea that Web 2.0 tools allow for the development of relationships with the sites, as they create, exchange and use information (Miller, 2005). These types of relationships are essential if we wish to ensure that our libraries continue to be meaningful today and into the future. The notion of community is one that appears in much of the literature around the library of the present and future. Valenza (2014) discusses the value of collegial interaction, as we surround ourselves with people who “reflect and share their practice through their slide decks, videos, blogs, and tweets—all high-quality, informal learning opportunities.” The importance of community applies not just to collegial connections, but also to users and the wider social network. Exploring options that are available to develop community connections is a vital aspect of library practice, and the proliferation of virtual worlds in today’s online experiences is a fascinating opportunity to develop community connections, allowing for a sense of presence for users who may not necessarily be able to be physically present, but can still develop that sense of community connection (Hill and Meister, 2013). It is important to consider the needs and interests of the users in these seemingly endless options for online community building, however. Rodgers’ blogpost discusses the concerns of more in-depth virtual worlds for people who aren’t familiar with the platforms (2015b). As such, it’s critical to consider the potential learning curve when deciding on using a social network or site, and analyse whether the benefit for the users is worth the potential problems that may be associated with its implementation and use. Given the proliferation of opportunities for information professionals in developing new ways to interact with, and provide services to, their users, it is inevitable then that there needs to be a reevaluation of the way in which libraries are managed. This reflects both on the types of leaders we have in our libraries, and the policies which govern the management of 21st century library services. It is vital that policies which are put in place provide flexibility for growth, and allow for future innovations. As such, they should provide guidance for actions and interactions, rather than specific instructions which relate to individual sites, as discussed in Rodgers’ blogpost “Social media: engagement with policies” (2015c). Policies which support the development of effective social media profiles will reflect the value of every person’s contributions – both those from staff members, and from students and community members. Implementing policies which support and encourage positive interactions, respond to negative comments and replies with tact and honesty, and demonstrate trust in the integrity of those participating, will help establish the integrity of the social media account (socialmedia.biz, 2015) and ensure it’s effectiveness for its users. So, what does all that mean for the information professional of today, and days to come? It would be a mistake to assume that, because the library of the future is so dependent on the input of so many other people, the librarian is of less importance. The reality is that a library is, in many ways, driven by the personality of its leader (Donovan, 2009). If a teacher librarian in charge of the learning heart of the school models a sense of courage and innovation, students are more likely to be inspired to adopt the same practices. If TL demonstrates a willingness to learn and fail in order to achieve new outcomes, their staff are more likely to join them on the journey. An information professional, supported by effective and innovative social media policy, and willing to embrace new opportunities and experiences in developing connections, both with people and information, will have amazing impacts on the learning culture in their school. What an exciting opportunity. Valenza, J. (2014, December 18). School Library Journal.